We reprint below a June 25 leaflet by the Spartacus Youth Club in defense of those arrested at a fee hikes protest initiated by Students for a Democratic Society (SDS) and the UCLA Student Worker Front (SWF) at the University of California, Los Angeles on May 14. The leaflet was handed out at UCLA and to AFSCME Local 3299’s strike the week of July 14-18. Keenly interested in the leaflet, many striking workers expressed solidarity with the arrested students and an understanding that massive fee hikes have made a university education unaffordable for their children. The Los Angeles Spartacist League and SYC also distributed the leaflet at the Los Angeles Social Forum on June 28. Part of the World Social Forum, which is funded by capitalist states and the CIA-connected Ford Foundation, among others, the L.A. event was a popular-frontist formation—a class-collaborationist political bloc in which the politics of the working-class component of the bloc are subordinated to the politics of the bourgeoisie. (For more on the Social Forums, see “Social Forum Con Game,” WV No. 853, 2 September 2005.) The L.A. confab was endorsed by the radical-liberal SDS and endorsed or built by a slew of reformist fake-socialists, including the International Socialist Organization, the Revolutionary Communist Party and the Party for Socialism and Liberation. We aggressively intervened to oppose and expose the Social Forums, including those who endorse and join them, as obstacles to the fight against capitalist imperialism and the struggle for socialism. On May 14, 16 people, all but one students in the UC system, were arrested on charges of “willful disturbance of a public meeting” on the UCLA campus for protesting a 7.4%, or $490, tuition fee hike approved by the UC Regents. Led by the Students for a Democratic Society at UCLA, as well as the UCLA Student Worker Front, more than 100 demonstrators attended the protest outside and about 80 attended the UC Regents meeting. After the Finance Committee of the Regents approved the fee increase, students chanted “Regents, regents, can’t you see? You’re creating poverty!” In response, campus police physically removed and arrested the 16 protesters. In at least one instance, several cops wrestled one protester to the ground and then charged him outrageously with resisting arrest. At the Monday 16 June court hearing, all charges were dropped against 14 of the protesters while two still face further proceedings. Despite our political differences as Marxists with the radical liberals of SDS and SWF, we in the Spartacus Youth Club defend them and all the activists who protested the fee hikes against police and administration repression and reprisals. Drop all charges against the protesters! Cops off campus! Tuition has nearly doubled at UC campuses in the past six years. The massive fee and tuition hikes in the last decade have meant that a once affordable university education has become unattainable for most poor, working class and minority students, making a university education increasingly an exclusive privilege of the elite. The fee increases, combined with the bourgeoisie’s drive against affirmative action, have also amounted to a racist purge of black and minority youth from the campuses. We in the Spartacus Youth Club have defended affirmative action programs for university admissions against ruling-class assault because they have meant gains, however limited, against the inherent race and class bias in higher education under capitalism. We fight for free, quality, integrated education for all! At the university level, this means a fight for open admissions and no tuition, along with government-paid living stipends for all students! Nationalize the elite private universities! Massively expand remedial programs for students relegated to inner-city public schools that are often nothing more than holding pens for poor, working class and minority students! SDS and SWF call to “democratize the UC Regents.” In contrast, as the SYC argued in a 2006 leaflet distributed at a UCLA protest against low minority enrollment, we are against “promoting the capitalist government, its politicians, the regents and campus administrations as the agency for providing access to higher education for black and minority youth.... The UC Regents, who banned affirmative action in admissions even prior to Prop. 209, are the capitalist class watchdogs over the university. Most are themselves capitalists or executives of corporations, banks, investment houses and the like....” (reprinted in WV No. 881, 24 November 2006). This is shown clearly by the struggle being waged by the campus workers of AFSCME Local 3299 against the UC campus administrations in an effort to win wage parity with other state workers and for better working conditions. The SYC stands in solidarity with these campus workers. These workers and their children, like everyone, deserve the right to the same quality of education provided at schools like UCLA. Abolish the Board of Regents and the administration! Those who work, study and teach at the universities should run the universities—for worker/student/teacher control! Ours is a revolutionary Marxist program. While SDS pushes to reform this rotten system, we fight to win workers and students to the understanding that we need a revolutionary workers party that fights for a socialist revolution that will consign this barbaric capitalist system to the trash heap of history. SDS is a part of the radical liberal milieu that actively pushes “anybody but Bush” politics. Their efforts are aimed at pressuring (through various means, including “direct action”) and boosting the electoral fortunes of the Democratic Party, which is the other capitalist party of racism and imperialist war. Indeed, when the SYC was distributing our defense letter defending those arrested for protesting fee hikes, SDSers told us that they were going to vote for Democrat Barack Obama in the upcoming presidential elections. In contrast, as Trotskyists—revolutionary Marxists—we fight for the political independence of the working class from the capitalist class enemy. We do not extend any political support on principle to any capitalist politician—Democrat, Republican, Green or Independent. We struggle to win students to the understanding that only one class in society has the social power and material interest to overthrow capitalism: the multiracial working class. Such a perspective is counterposed to the various “antiwar” coalitions, such as Coalition for Peace at UCLA with which SDS works. In November 2007 SDS and Coalition for Peace organized an Iraq Moratorium Rally and Die-in at UCLA as part of the national Iraq Moratorium, which does not oppose the bloody U.S.-led occupation of Afghanistan. This coalition is consciously built to appeal to liberal Democrats, who look to cut U.S. losses in Iraq in order to reinforce American military capabilities elsewhere. 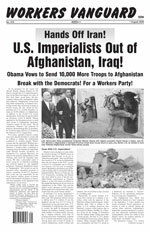 All the major Democratic Party politicians support the occupation of Afghanistan, presenting themselves as even tougher than Bush and Co. in the “war on terror,” and targeting the bureaucratically deformed workers state of China, the largest and most powerful of the remaining countries where capitalist rule was overthrown. We demand the immediate and unconditional withdrawal of all U.S. troops from Iraq and Afghanistan! U.S. imperialists, hands off the world! SDS is a product of liberal “death of communism” politics that slander communism as a “failed experiment” and accept the framework of bourgeois class society. Thus, SDS rails against “ideology” and “vanguard parties,” which boils down to outright hostility to a revolutionary, internationalist, proletarian program and the Leninist party necessary to fight for such a program. Such politics are the product of the profound retrogression in political consciousness since the 1991-92 capitalist counterrevolution that destroyed the Soviet Union, the world’s first workers state and industrial-military powerhouse of the non-capitalist world. This was a world historic defeat for the working class and oppressed. Just as we fought for unconditional military defense of the USSR and Eastern European deformed workers states against capitalist counterrevolution and imperialist attacks until the bitter end, today we defend those countries where capitalism has been overthrown—China, Cuba, North Korea and Vietnam. Our model is the Bolshevik Party under V.I. Lenin and Leon Trotsky which led the Russian Revolution of October 1917, placing the working class in power and emancipating one-sixth of the surface of the earth from imperialist capitalist exploitation. We fight for new October revolutions in this imperialist “belly of the beast” and internationally. If you want to put an end to this system of imperialist war, racism, oppression and exploitation, check out the SYC! We reprint below a 1 June letter by the Los Angeles Spartacus Youth Club to L.A. City Attorney Rocky Delgadillo protesting the charges against the protesters. The Spartacus Youth Club vehemently protests the arrest of Anna Sterling, David Chavez, Juliet Ovalle, Gloria Negrete-Lopez, Josh Galang, Noah Ebner, Nathan Wright, Cheye-Ann Corona, Mark Columbus, Heather Shapiro, Rob Sierakowski, Alberto Ortiz, Kimberly Torres, Diane Valencia and two other protesters at a protest initiated by the SDS and Student Worker Front at the May 14 UC Regents meeting at UCLA. We demand that all charges be dropped now! Students from several UC campuses attended the Regents meeting and were rightly outraged when the finance committee voted for a huge 7.4% increase in student fees. The campus police were quickly called in by the Regents to silence the students’ dissent. Sixteen of the protesters were handcuffed, physically removed, arrested and charged with “willful disturbance of a public meeting.” In at least one instance, several cops violently forced a protester to the ground and then slapped him with an additional charge of resisting arrest. These youth are under attack for protesting for the right to an education for black, minority, and poor students. Drop all the charges now!